Received 29 April 2010; revised 20 May 2010; accepted 25 May 2010.
resulted in closer scrutiny of the services provided. legislation prevents its full use in Medicare. ties of many financial managers are now well known. hopefully, provoke introspection and error learning. seriously distort reality (cf. risk versus uncertainty). 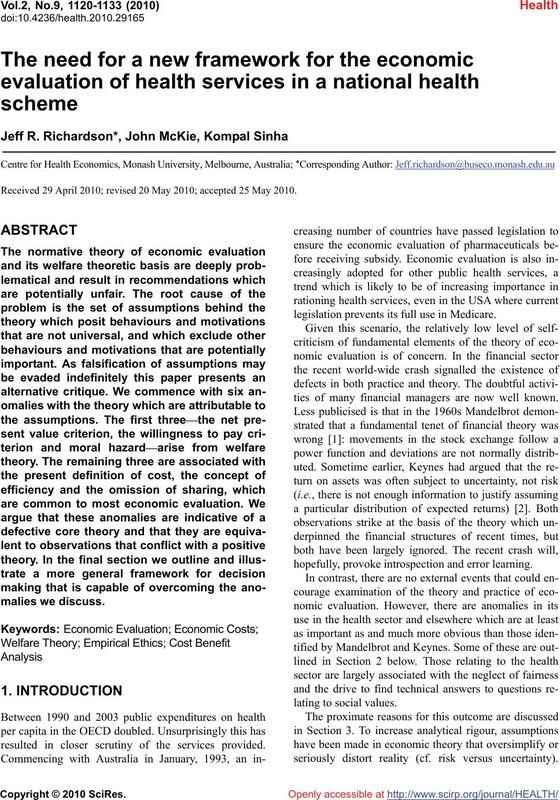 a better framework for economic evaluation. 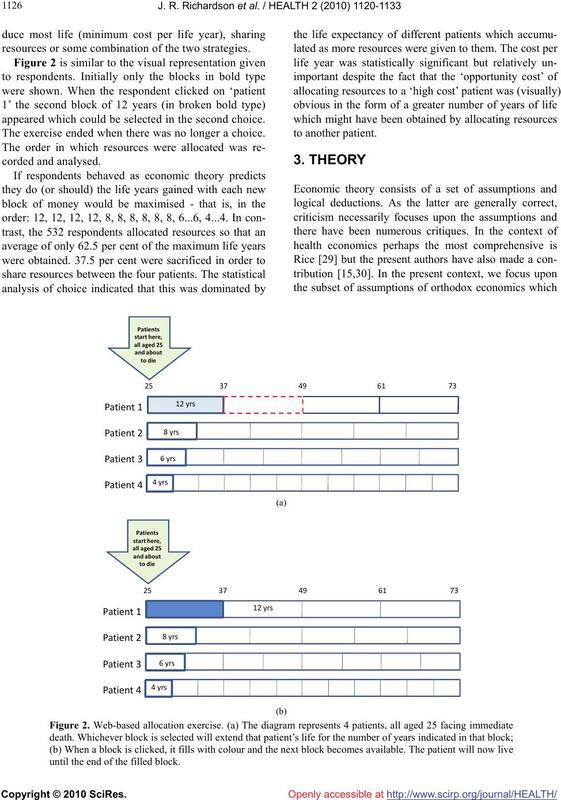 (B > C), or that net present value is positive (B – C > 0). cept compensation for assuming a risk of death [5,6]. ‘theoretically correct’ solution to economic problems . utility can be gained if the resources are used elsewhere. preferential’ reasons, based on ‘duty’ or ‘commitment’. pointed out , other motivations are clearly possible. 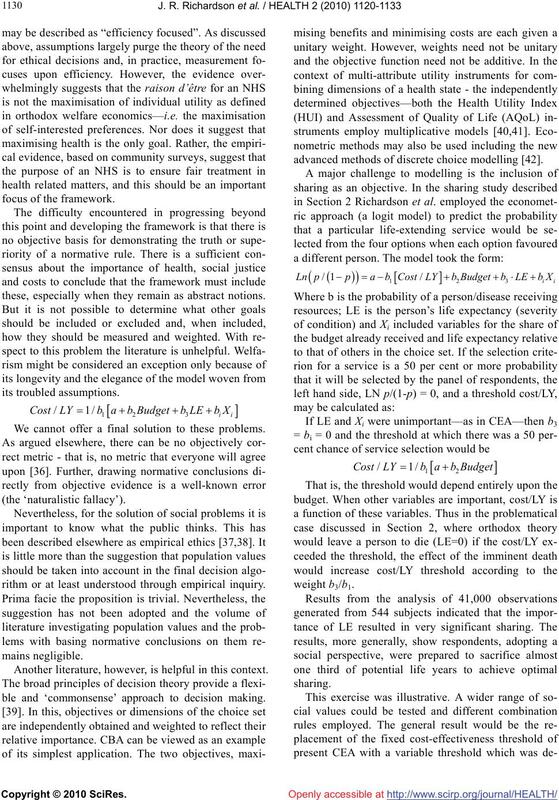 outcome’ described by welfare theory does not occur. 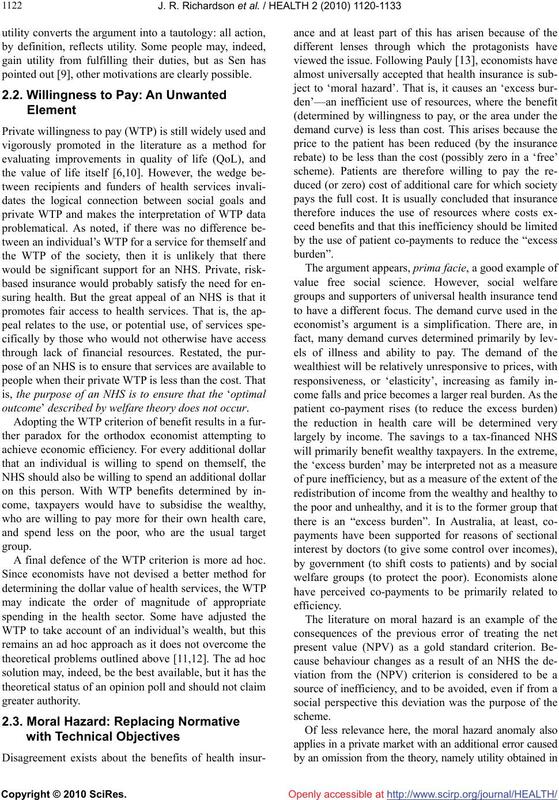 A final defence of the WTP criterion is more ad hoc. 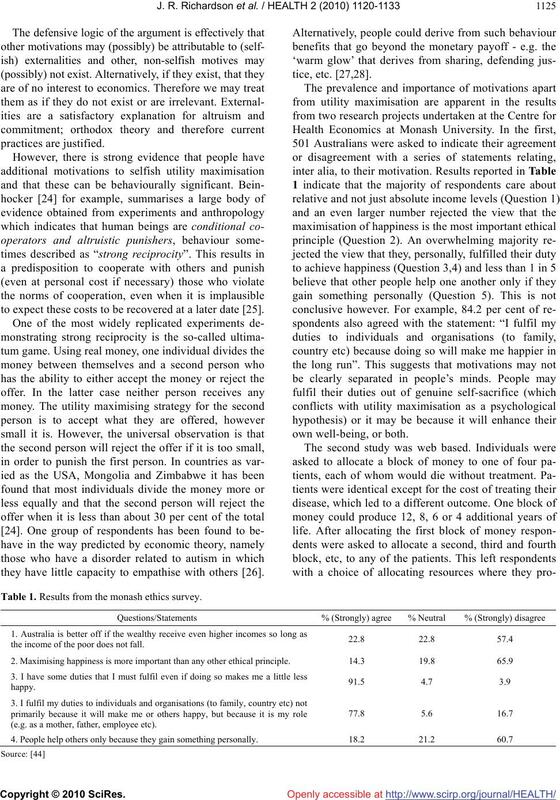 purpose of altering realised spending in the case of illness. it encounters problems which also apply to CBA. may not be the resource costs of economic theory, i.e. through the taxes and premiums that finance the NHS. gained (or not lost) by a patient’s return to the workforce. uity of access to needed services (somehow defined). those close to major hospitals and medical facilities. cannot be achieved by focusing only upon one of these. evidence relevant for its assessment. inclusion in empirical studies have been neglected . not all treatments can be provided irrespective of cost. as beneficiaries in the equity-efficiency trade-off (e.g. not caught up with practice. way each individual maximises their utility or wellbeing. for another, this must be construed as utility maximising. tify the retention of the narrow focus of current practice. to expect these costs to be recovered at a later date . they have little capacity to empathise with others . Table 1. Results from the monash ethics survey. (e.g. as a mother, father, employee etc). resources or some combination of the two strategies. appeared which could be selected in the second choice. The exercise ended when there was no longer a choice. until the end of the filled block. of costs to benefits as these terms are defined. nificantly affect social welfare via envy. life year (LY) or quality adjusted life year (QALY). Box 1. The logic of cost benefits analysis. Box 2. 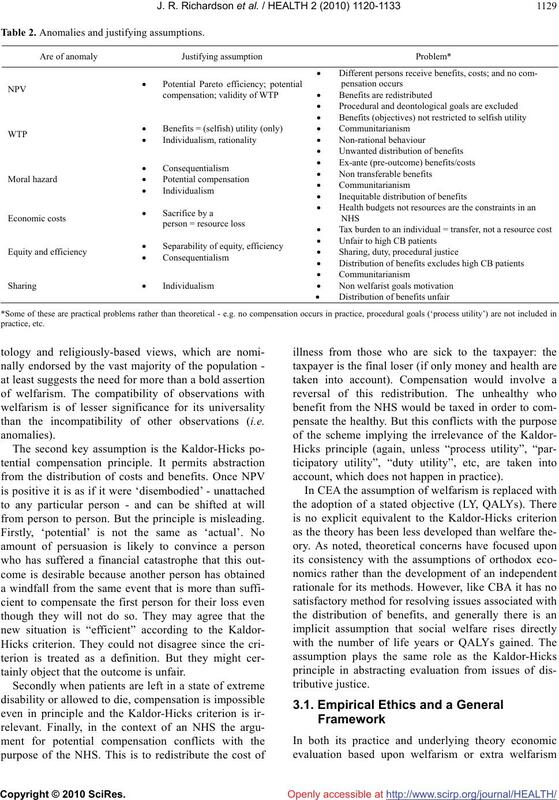 The logic of cost effectiveness analysis. (step 3) which increases social welfare (step 4). fects) are in fact quantitatively important. been justified by an appeal to extra-welfarism. Coast et al. lish it as being the exclusive objective for an NHS. 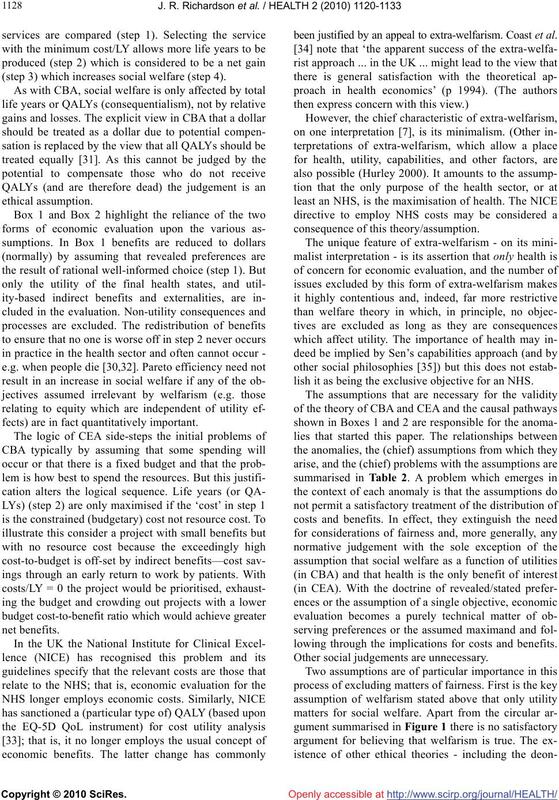 lowing through the implications for costs and benefits. Other social judgements are unnecessary. Table 2. Anomalies and justifying assumptions. than the incompatibility of other observations (i. e.
from person to person. But the principle is misleading. tainly object that the outcome is unfair. account, which does not happen in practice). these, especially when they remain as abstract notions. We cannot offer a final solution to these problems. rithm or at least understood through empirical inquiry. Another literature, however, is helpful in this context. ble and ‘commonsense’ approach to decision making. advanced methods of discrete choice modelling . vice and the extent of sharing. lem and welfare theory is simple, elegant and beguiling. incorporate elements that are undoubtedly important. not fall down and the stock exchange will not collapse. have not focused primarily upon the assumptions. could also overcome the anomalies discussed here. sis and if they lead to anomalies in normative theory. Mandelbrot, B.B. (1997) Fractals and scaling in finance. Skidelsky, A. (2009) Keynes: The return of the master. consumer behaviour. Economica, 5(17), 61-71. Sen, A. (2009) The idea of justice. Allen Lane, London. 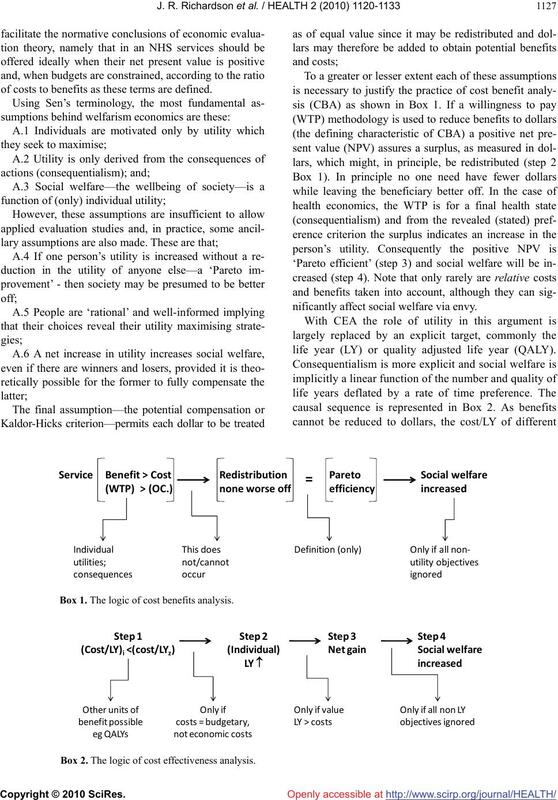 QALY gained: What is the threshold of cost effectiveness. 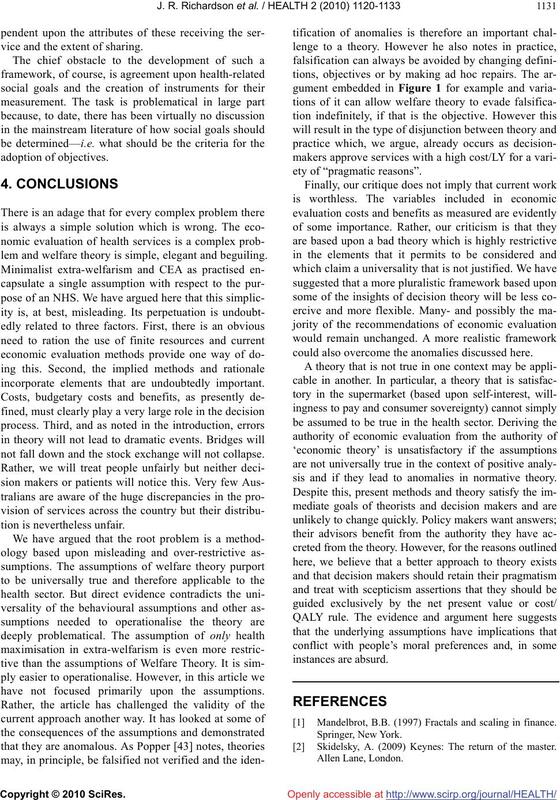 the ‘social’ value of a QALY: Four core issues to resolve. Comment. 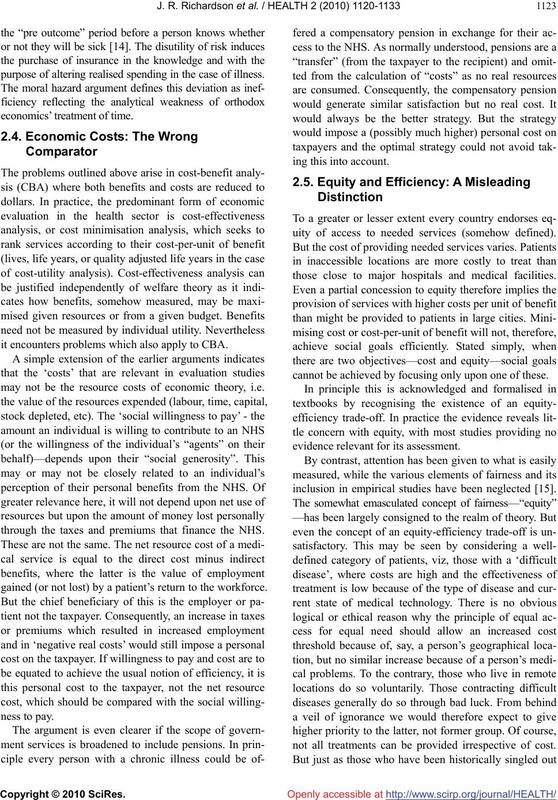 American Economic Review, 58(1), 531-537.
ence & Medicine, 60(2), 247-255. Forsythe, R., Horowitz, J.L., Savin, N.E. 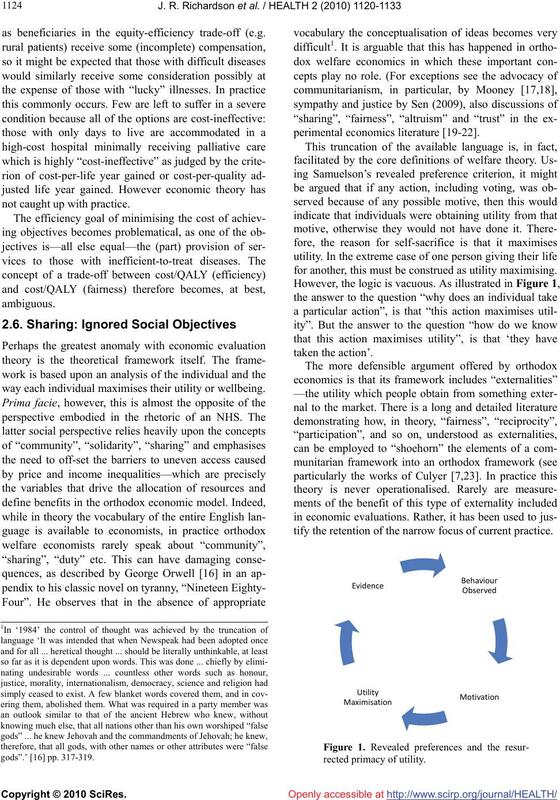 and Sefton, M.
and Economic Behavior, 6(3), 347-369.
complexity, and the radical remaking of economics. makes up its mind. Edinburgh Canongate Books. nal of Political Economy, 97(6), 1447-1458. 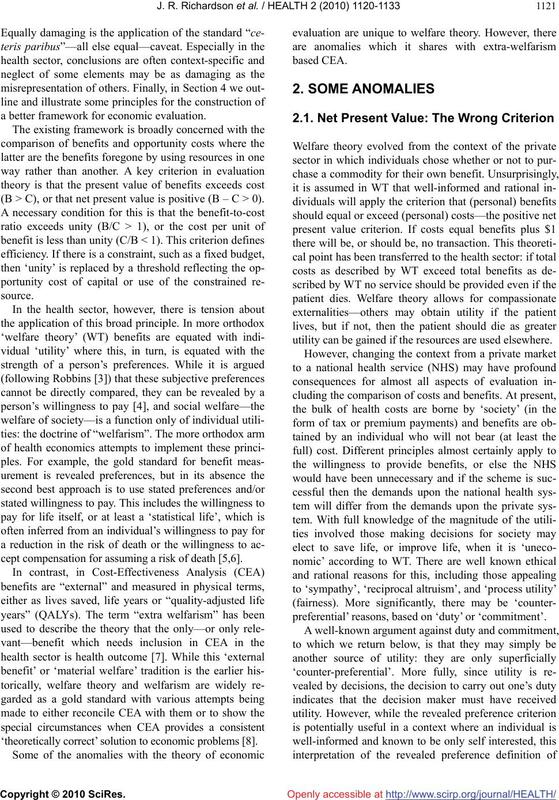 Rice, T. (1998) The economics of health reconsidered. Health Administration Press, Chicago, Illinois. an ideal metric for health service benefit measurement. 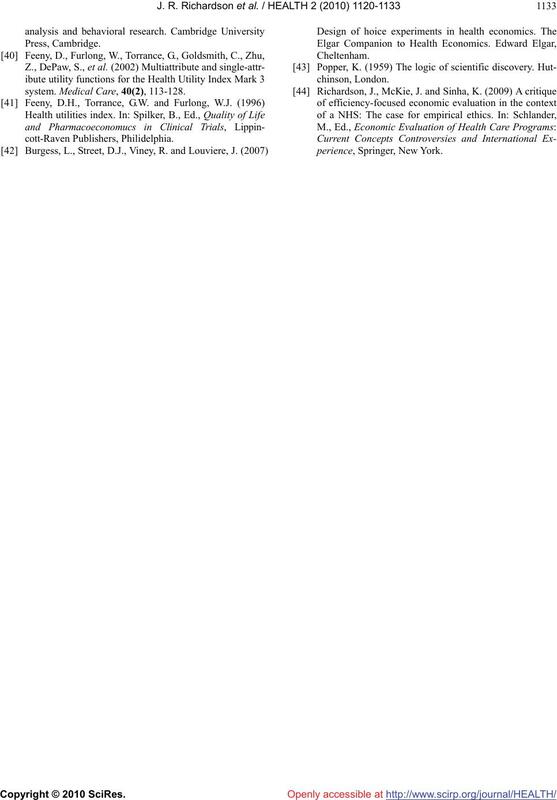 Science & Medicine, 60(2), 265-275.
system. Medical Care, 40(2), 113-128.